Fan favorite and USA Today bestselling author, Wendy Wax, is known for transporting readers to beautiful seaside locations with her immersive, fun and descriptive stories. With the perfect combination of good humor, plot twists and beloved characters, Wax delivers the kind of great escape reading that’s perfect for a day at the beach. 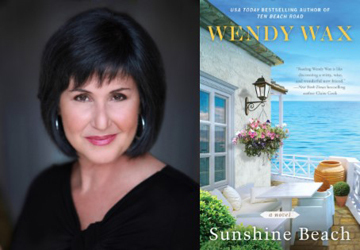 Inspired by The Rellim Hotel in St. Peterburg Beach, Florida where Wendy spent long, wonderful summer days of her childhood, Wax is back with her fifth and best yet Ten Beach Road novel, SUNSHINE BEACH (Berkley Trade Paperback Original; June 21, 2016; $16). Picking up where The House on Mermaid Point left off, fans of the series will delight in catching up with familiar beloved characters and new readers will have no problem sinking into the witty and heartwarming story Wax expertly crafts. Close friends Maddie, Avery, and Nikki are all struggling to figure out what to do next after losing their life savings in a Ponzi scheme and losing control over Do Over, their successful reality television show where they restored a beachfront property to its former glory. When Maddie’s daughter Kyra stumbles across a once magnificent beachfront hotel in need of fixing—an idea forms for the ladies to shoot their own television show about the restoration on their terms. What could possibly go wrong? Everything. With the cameras rolling, Maddie’s second-chance romance with her all-too-famous rock star boyfriend gets complicated, Avery struggles with grief over the loss of her mother, and Nikki’s reluctance to commit to the man who loves her could leave her to face the biggest challenge of her life. Even the Sunshine Hotel seems to be against them, when their renovation uncovers a decades-old unsolved murder which just might bring their lives tumbling down all over again. Sure to resonate with readers of Elin Hilderbrand and Jane Green, SUNSHINE BEACH is a warm and insightful look at love and the bonds of true friendship. I hope you’ll consider it for review or feature attention this June or July. Wendy Wax is available for interviews.